Did you know that when "Jurassic Park" was made in 1993, the animatronic Tyrannosaurus rex was built full-size and weighed 9,000 pounds? Or that the Brachiosaurus' head alone required four separate puppeteers? Or that Some of the "kitchen attack raptors" were played by an actor in a human-sized raptor suit? All of these facts are now public, thanks to a series on YouTube about "Jurassic Park" videos posted by the Stan Winston School of Character Arts, which is run by the studio that designed the dinosaurs. The school posted the latest video on Sunday, just a few days after the 3D release of the first "Jurassic Park," showing the production of the movie's animatronic T-Rex. 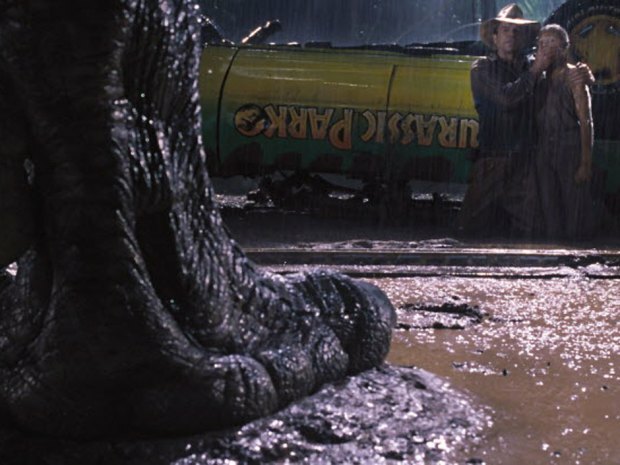 The first videos in the series, released in 2011, show footage from "The Lost World: Jurassic Park" in which the dinosaurs are tested before their big-screen debut. Since then, the school has posted several videos from all three movies, including production of the first movie's spitting dilophosaurus and a test of the third movie's Pteranodon suit.